About 18 years ago I bought a pair of clarinets from Ridenour Clarinet Products. 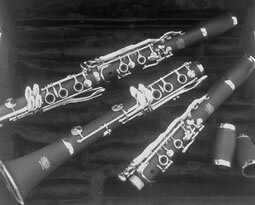 These were the new original “Lyrique” 576 clarinets which are manufactured in China to Tom Ridenour’s rigorous specifications, shipped to Tom in America and hand finished by him. I must admit I was sceptical about these instruments made in China from hard natural rubber.For the last Twenty two years and at the current time (2015) I have worked in the orchestra of Welsh National Opera as principal (Solo) clarinettist and these clarinets have been given a really extensive workout in the years I have had them and subjected to high profile engagements – even B.B.C. television performances. They came through with flying colours. I first performed with them in a schools educational concert and did not tell anyone I was using inexpensive clarinets made in China. No one noticed any difference in my sound or intonation except my 2nd clarinettist noted my intonation was slightly better in places. I normally use Leblanc Opus clarinets, the development of which Tom was involved in (and this most probably accounts for the superior tuning scale of the Opus clarinet compared to most other leading makes except the Lyrique (or even better the new Libertas). Several years ago one of the first concerts I used them on was an outdoor B.B.C. televised concert from world renowned Bryn Terfel’s “Faenol” Festival in which I had two exposed solos. The first, “E Lucevan le Stelle” from Puccini’s “Tosca” and the second in the beautiful aria from “Samson and Delilah” by Camille Saint-Säens called “Mon Coeur S’ouvre à ta Voix”. Both solos came across on the broadcast with fine projection, good intonation and excellent evenness of note size and a silky tone with sensitive inflections made easy because of the amazing flexibility of the Lyrique. These days I have finally agreed to be an agent for Ridenour in the U.K. because I am sick of the anti – Chinese-made stigma that sometimes tars Ridenour clarinets with the same brush as other less scrupulous manufacturers. I originally explored the possibility of using them simply because I needed a spare pair of clarinets to leave in my locker at the Opera house and also wanted a really in tune C clarinet – a rarity in my opinion in wooden versions available at a price I could afford. I had experienced a lot of problems with cracking barrels and was very concerned my wooden clarinets may crack. I thought the rubber material ideal, being impervious to the dry atmospheric conditions in the Opera house (there were major humidity problems – the air was too dry lots of instruments were cracking) so I contacted Tom and he sent me a pair of the Lyrique clarinets to try. I had already bought the “Arioso” C clarinet (which I use exclusively and actually sold my wooden C) and found this Ridenour C instrument to be excellent. I was quietly confident that there would be little risk of disappointment in buying these instruments from Tom because he is a man of great integrity and very honest and also the closest thing to being a “genius” in clarinet acoustics. There is a lot of concern and misinformation about inexpensive imports made in China and in my opinion these concerns are often justified. In the case of Tom Ridenour’s clarinets manufactured in China I must stress he has been painstaking to ensure that they are excellent value for money. Some Chinese manufacturers have been known for making inexpensive, low quality products, but conversely the Chinese craftsmen are capable of manufacturing musical instruments to the highest levels of excellence, it is purely a matter of cost to the end user. If the end user would be prepared to pay as much for a Chinese – made clarinet as for a top professional model from U.S. or Europe I am convinced the Chinese would produce a superior product. Unfortunately, some unscrupulous entrepreneurs have flooded the market with really excessively cheap instruments (which have been made to a very low manufacturing costing to gain maximum profit) and I am concerned there is a danger that clarinets such as the instruments designed by Tom Ridenour are “tarred with the same brush”. To say these clarinets are a better build quality than the leading makes would not necessarily be true . I have had fears about the key work but in 15 years of relatively active service from the C and from the Bb and A they have nevertheless stood up to the slings and arrows of a full time Opera job in which I play about 100 concerts / performances per year minimum, plus all the associated rehearsals and teaching and demonstrating . I have very acid skin and usually wear through plating very quickly so I took the precaution of coating the keys in clear nail varnish which will eventually wear but can be renewed – this is a good tip for those with skin acidity such as mine. there are other strong lacquers one can apply to help buffer the key work from acid skin. The clarinets were tested using Brad Behn mouthpieces and checked for intonation on an advanced fine tuning programme designed by Alistair Logan, which measures notes in megahertz but extremely accurately – taking samples of the note’s tuning every megasecond and showing an instantaneous readout – so one can see if one is altering breath pressure or embouchure pressure at a glance and is considerably more accurate than any tuner I have seen. It can even be overlaid and printed out to compare other results hence a direct comparison can be made: it blew all the other clarinets (Selmer Recitals , Leblanc Opus and Buffet clarinets ) in my armoury out of the water so to speak as it was so much more in tune. They proved to be more in tune than any clarinet I have tried. No clarinet can be said to be perfectly in tune and at best compromises must be made but the Lyrique has the closest twelfth and octave relationship of any clarinet I have tried. This comes with a very small down side in as much as I found the low E and F on that model (15 years ago) (only in extreme piano or pianissimo) to be infinitesimally sharp (but compared to most clarinets that are usually quite flat in this area which have wider twelfths and octaves this is a tiny compromise and the benefits far outweigh this small inconvenience (update 2015 – new – from Les : on the new Libertas, Tom has fixed this problem and it is perfectly in tune in the low register and has a much richer sound than the Lyrique in that area. ). My only other small reservation was the thumb rest – I would urge Tom to design a really comfortable one and charge a little more for this. I changed the thumb rests to the Kooiman etude model (The original Lyrique design, although adjustable and positioned more sensibly than on most other makes of clarinet was still too low and uncomfortable for me personally). To summarise, I will list the attributes I think most advantageous in order of preference. Expressive playing is easy – there is less resistance in the bore (especially on the A clarinet) and this facilitates crossing all registers – no “bump” going over the third break from thumb C to D. This also enables incredibly light staccato – I am playing them currently in Rossini’s “Cenerentola” and the fast, light, piano staccato is achieved with much greater ease than on wooden clarinets without loss of quality. Intonation, stability of pitch and evenness are a blessing. All of these things are essential to a professional player and the Lyrique delivers all of these qualities. I played in both hot studios and cold outdoors concerts – the Lyriques dealt with both situations in excellent fashion. Weight – they are very light on the thumb and ideal for ageing professionals (like me) and young players alike, being considerably lighter than Grenadilla clarinets without corresponding loss of quality in sound. Cost. They are easily affordable for most aspiring clarinettists and particularly for those young players who can only afford to buy one wooden clarinet but need to play in an orchestra and require an A clarinet – a matched pair of Lyrique clarinets costs less (case and 4 barrels included) than one conventional professional model wooden clarinet. I am not suggesting for one minute that these clarinets will be ideal for everyone – sound and personal preference cannot be ruled out but the plus points far outweigh the very few minuses when evaluating these clarinets. The design of the Libertas has amazing improvements over the 576 original and has anchored posts on almost every post which makes for an incredibly solid clarinet key – wise – plus the reinforced crows foot and key cup arms makes for an incredibly robust clarinet in terms of key work as well as the internal bore stability. It also has the old style excellent Leblanc with “jump” R/H side trill keys which ensure a consistent pad closure even when the clarinet key work wears, unlike normal trill keys that can move sideways on their axis and often do not return in the same position as they came from when opened – leading to missed notes and even squeaks. At such a competitive inexpensive price the Lyrique and Libertas offer a chance for those with limited budgets to own a pair of beautiful matched clarinets with superior tuning, evenness and superb sound quality over all registers. For professional clarinettists the ease of staccato, facile high register and lighter quality of beautiful “Bel Canto” sound is vailable at great ease especially in piano and will be a terrific option for those like me having to perform a wide variety of styles of music from Mozart to Rossini, Berg and Macmillan. The Lyrique and Libertas can confidently handle most repertoire that any form of music can throw at it. This new review – revision is an objective point of view based on facts and not just an “agents hand – out” – I am very proud of my reputation as a player and would not endorse a product I would not play and use myself – so if that gives potential buyers confidence – then I am happy. Do come and try them for yourself and make up your own mind. You will not be disappointed. If you think this review is positive then I can add – the Bass clarinet is just as good as the soprano clarinets and even better value in my opinion.